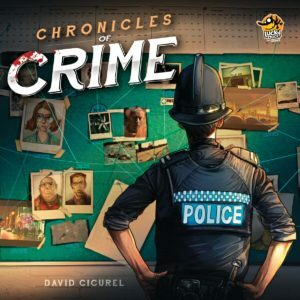 This Chronicles of Crime review was made after playing through the tutorial and the first four cases. This was previously a Kickstarter preview, but it was turned into a full review on October 29, 2018. Chronicles of Crime is a crime-solving cooperative game in which you and your friends investigate crimes around London. You’ll be using an app to scan QR codes found on all of the cards in the game, and you’ll also be able to search for clues around different locations by using virtual reality glasses. Chronicles of Crime was designed by David Cicurel and is published by Lucky Duck Games. At the start of each game of Chronicles of Crime, you’ll choose a case to try to solve and place the boards and cards around the table. You’ll place a starting character (I think it’ll always be the Chief Officer) at the police station and you’ll get some initial info about the case. Throughout the game you’ll be going to different locations and interrogating people while trying to solve the case. To do this, you’ll be scanning the cards’ QR codes with your mobile device and reading what’s at the locations and what the people have to say. You’ll also be able to search around crime scenes and other locations for clues. 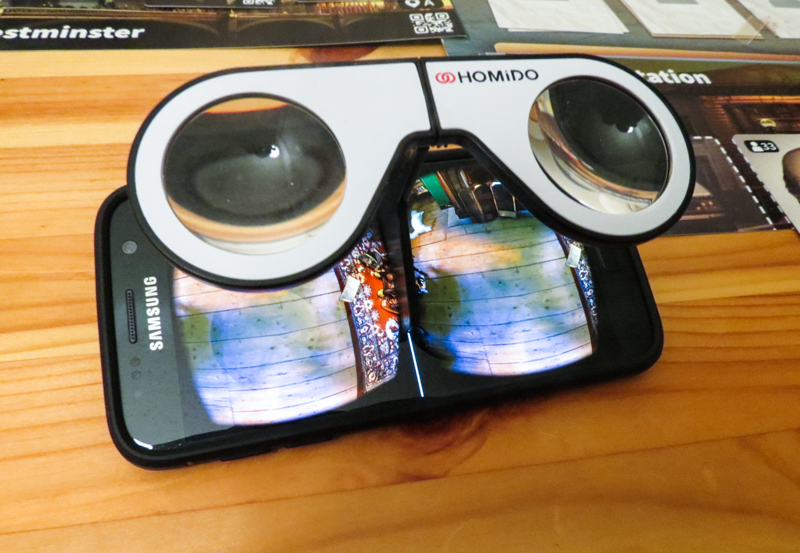 To do this, you’ll either place the VR glasses on your mobile device to look around the location, or you have the option to simply look around the location on your device without the glasses. There are Evidence Category and Special Item cards that you can place on the board whenever you find clues. When you’re interrogating people, you can scan the items or even other people to see what they know about them. You can also turn to the four Forensic Contacts for help by simply scanning their cards and listening to what they have to say about the items and people you have found. Every time you talk to people, search for clues, or move from place to place, time passes. The less time you take to solve the crime, the higher your score will be at the end of the game. Once you feel like you’ve solved a case, you’ll go back to your home location and answer some questions. You’ll get your final score based on how well you answered the questions and the amount of time you took to solve the case. I was worried that this wouldn’t work too well as a co-op game, but it really does. Sometimes you’ll miss something while searching for clues or you’ll need help figuring out who to interrogate next, so it’s definitely nice to have one or two other people with you. I actually wouldn’t recommend this as a solo game for those reasons. Looking around the crime scenes is both tense and very satisfying. You only have 40 seconds each time you look around so you want to share as much information as you can with your teammates. It’s even fun for the other players because they want to absorb all of the information you’re sharing and find any relevant Evidence Category cards. I’m glad that there is very little hand-holding in this game. You can get very minor clues from the Chief Officer from time to time, but for the most part you’re on your own to try to solve the cases. It’s really great that the app gives you the option to search for clues with or without the VR glasses. I, unfortunately, get virtual reality sickness, so it was nice that I wasn’t forced to use the glasses. Both options work very well. You’re not going to find too many games that are easier to learn than this one. The tutorial is great and everyone should know how everything in the game works within five minutes. I’m really glad they included a History feature in the game. You usually have quite a bit of information to remember, so it’s nice that you can look through past clues and interrogations. I’m a big fan of the insert in the box. The plastic cover keeps the cards in place and there is plenty of room in the insert for future expansions. It’s a little odd that they chose to use London as the setting for this game. Arguably the best co-op detective game out there, Sherlock Holmes: Consulting Detective, is set in London, so it would have been nice to do some investigating in a different city. Even though this wasn’t a problem for my group, I think some people might find Chronicles of Crime a bit frustrating because there are so few hints given. If you get stuck, there’s really not much you can do except go “solve the case” and figure out what you missed. Again, I like it the way it is, but I think some folks would prefer more hints. 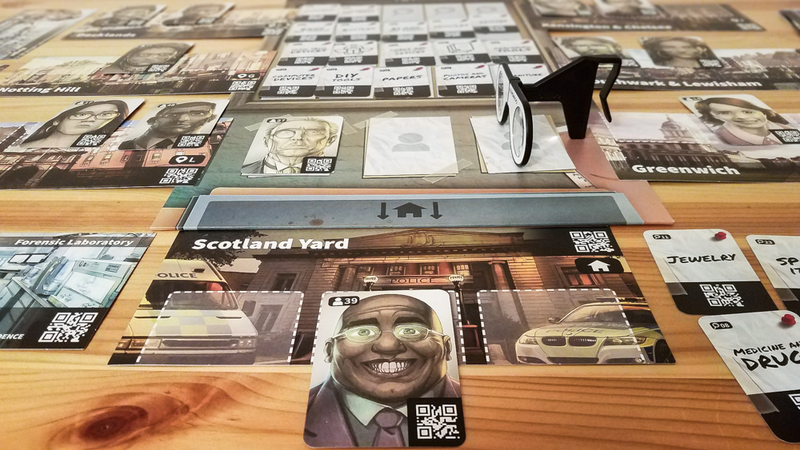 If you struggle with deduction games, you might feel a bit left out while playing Chronicles of Crime. This is especially true if the other people in your group are good at solving these types of puzzles. The Chronicles of Crime app really kills my phone’s battery, especially during longer cases. That’s not too surprising since the app is on throughout each game, but I had to plug it in during multiple cases. That’s actually a problem since you want to be able to pass your device around so everyone can scan cards and boards. That’s also a problem if you’re playing the game and don’t have an outlet near you. Chronicles of Crime is a game that most co-op fans will want to check out. It brings something new to the detective genre and there is quite a bit of content in the box and in the app. I’ve now played this game with seven people and six loved it while one didn’t because he had a tough time connecting the dots. This is actually now a top 10 co-op game for one person in my group, so it has been a pretty big hit. I’m a fan of Chronicles of Crime and I can’t even use the VR glasses! The cases are interesting and challenging, and you really do feel great when you’re able to work together to solve them. If you like the idea of mixing crime solving with a little bit of virtual reality gameplay, you 100 percent should check out Chronicles of Crime. The only people who I would not recommend this game to are those who dislike detective games and those who absolutely, positively will not play a board game that requires an app. UPDATE: Chronicles of Crime made it onto our Best Cooperative Board Games of 2018 list! UPDATE 2: It also made it onto our Top 40 Co-ops of All-Time list! UPDATE 3: We now have a review for the game’s expansion, Chronicles of Crime: Noir. Thanks for taking the time to read our Chronicles of Crime review! To stay updated on all things cooperative board games, follow us on Twitter, Facebook, or via RSS.